I mentioned earlier the argument that "Resisting will only make matters worse". When I first heard this I felt sorry for those who asked this question. Although they looked like normal healthy people they have obviously been conditioned to believe that "resistance is futile", not only futile but counter productive. Again, admittedly there are times when one should not resist. If ten guys have guns pointed at you it is probably a good idea to listen to what they have to say. Most of time, I believe, one should resist, again, at the proper time and in the proper way. Giving up without a fight is rarely a good idea. It will certainly invite future attacks on yourself and others. Now I said sometimes the odds are against you. I also said you have to choose wisely in terms of how to fight back. Say it is one against ten, or one against one hundred, not so great. Now what if it is one little girl against a mad fascist racist tyrant and an entire empire that has joined with him? What can you do? 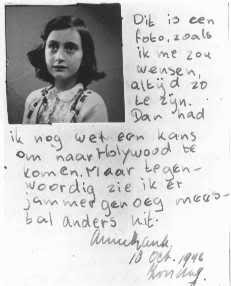 Well, that is exactly the situation a little Jewish girl named Anne Frank faced during the years 1942 – 1945. Her response? Her response was to defeat the tyrant by not giving him what he really wanted. He wanted to dehumanize her, so she kept her humanity. He wanted to make her just another faceless subhuman, she grew into an independent personality. Anne Frank before she went into hiding. She was eventually deported to a concentration camp where she died. She was less than 16 years old at her death in Bergen Belson, Germany. In her circumstances she could not defeat him physically, but she defeated him damn good! Sixty five years later half a million people each year, from all over the world, visit her hiding place. I doubt if anyone visits his home. To date millions of people around the world continue to read her diary, and to act out a play based on her diary, in English, Hebrew, Dutch, Japanese and many other languages. Her voice and her message are heard, his is only heard by a tiny group of social misfits. I just concluded reading a book on her life, and at the very end is a short piece by Miep Gies, the woman who helped hide Anne and seven other Jews for over two years. She writes, "To my great and abiding sorrow, I was not able to save Anne's life. But I was able to help her live two years longer. In those two years she wrote the diary that gives hope to people all over the world and calls for understanding and tolerance. It confirms my conviction that any attempt at action is better than inaction. An attempt can go wrong, but inaction inevitably results in failure. " No Krav Maga instructor could have said it better. 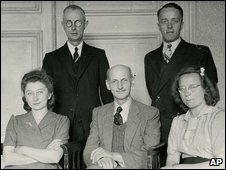 Miep Gies, bottom left, and Otto Frank, next to her. Photo taken before Otto and his family and four other Jews went into hiding in his office building in Amsterdam, Holland. Only Otto survived. Miep Gies passed away on January 12 of this year, 2010, in the Netherlands. She was one hundred years old.